Gold prices have risen above $1,300 an ounce for the first time since August 2014. This is due to the global economic slowdown, expectation of ECB ‘easy money’ and currency volatility, Mark O'Byrne, research director of GoldCore, told RT. The spot price has jumped by 1.5 percent to $1,303.63 for an ounce on Wednesday early trading. February futures rose by 1.2 percent to $1,292.50 an ounce on the New York Comex. Last week the price rose by 4.7 percent for the first time since 2013. Gold has added 10 percent to its value since the beginning of the year. Earlier this week the IMF and EBRD cut its forecast for world economic growth due to geopolitical tensions and falling oil prices. “Geopolitical risk is as high as its been in many of our lifetimes,” Mark O’Byrne, research director at Goldcore Ltd, one of the world's leading gold brokers, told RT, adding that the policy introduced by the central banks across the world has also added risks to the global economy. #Gold just ticked over $1300. Maybe the central banks are supporting the price to encourage "inflationary expectations." Another reason is the increased uncertainty in the financial markets about the success of the ECB’s plan to introduce quantitative easing. The US program of quantitative easing lead to a 70 percent increase in gold prices from 2008 to 2011. High volatility of currencies, including the Swiss franc and Russian ruble also added to the rising price. The cancellation of the euro peg on January 15 by the Swiss National Bank raised concerns about the currency’s reliability and triggered investors to search for new more reliable assets. O’Byrne suggests gold is a great hedging instrument. However, he wouldn’t advise to put all your assets into gold, as it constantly goes up and down. “The advice is you always put 5 to 10 percent of your wealth in gold. You hope the price for gold doesn’t go up very sharply because it generally means the rest of your wealth is not doing well. So that’s a very good hedge and diversification,” he said. The forecasts by investment banks for the gold market differ. Goldman Sachs and Societe Generale expect a decline in the price by the end of the year, with SocGen predicting a fall to $1,000 an ounce by December 31. O’Byrne says prices should increase, possibly 25-30 percent. He said it was unlikely that gold will rise to the figures of 2011 when it was $1,900 per ounce, adding however that last Thursday’s 40 percent jump of the Swiss franc shows that nothing is impossible these days. “If you see what happened to the Swiss franc vs. the dollar and the euro there last week, the Swiss franc rose by 40 percent against the dollar in about 13 minutes. So if it happened for the Swiss franc vs. the euro and the dollar, this can also happen for gold,” he said. 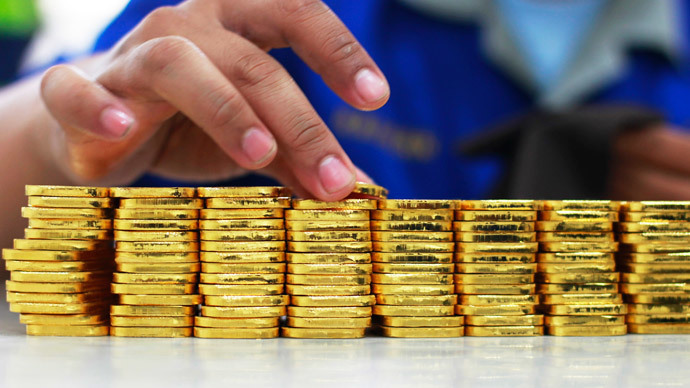 Meanwhile, analysts from Standard Chartered expect gold prices will strengthen to $1,320 an ounce in the fourth quarter amid the weakening of the dollar.